Thirty years ago, Max lost her humanity when her best friend betrayed her trust and turned her into a Shadowblade, a powerful witch’s ally who does her bidding. Max has always sworn that she will kill Giselle for what she did to her, but her daydreams of revenge are interrupted when the Guardians begin their attack on humankind. Max and Alexander, the Prime of Giselle’s arch enemy, set off to find Max’s family and bring them back to Horngate so they will be protected. Although she is attracted to Alexander, Max is suspicious that he will try to take her place as Giselle’s Prime now that he is no longer affiliated with Selange. There are plenty of obstacles in Max’s way as she searches for her long-lost family, and Max experiences first hand the devastating effects that the Guardians have on humans. When Max finally reconnects with her family, she is shocked that they are not surprised to see her again, which makes her question her entire existence. 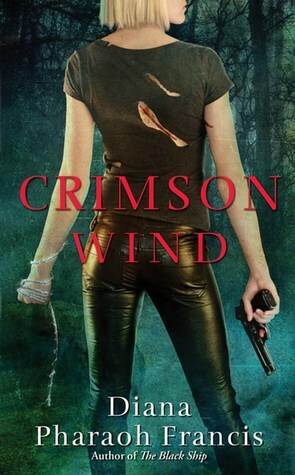 I was pretty excited to start Crimson Wind, the second book in Diana Pharoah Francis’s Horngate Witches series. Though the world building lost me in the first book, I was hoping for more clarity in the second book. However, I found it difficult to get into Crimson Wind because it seemed like a never ending stream of Max and Alexander fighting their attraction for one another and saving people from the Guardians’ mess; all I really wanted was to get to the part where Max would see her family face to face for the first time in thirty years. When Max and her father talk again for the first time, she cannot believe that he is not surprised she isn’t dead. Max (whose real name is actually Anne) learns that her family knows all about witches, and she feels a bit betrayed by them as well. Crimson Wind ends on an exciting note, and while I plan to keep reading the series, I hope that Shadow City has more of an actual plot. I found myself skipping over the steamy scenes between Alexander and Max (in my opinion, they were poorly written), and I was less than thrilled with many of the grammatical errors I found in the book (note: I read a finished copy of this). My expectations are not high for Shadow City, but i am curious to see what will become of Max. Looks like an interesting book, I love the supernatural type kind so will look it up, thanks! I’ve got the first book and I’m really looking forward to reading it because the idea of Shadowblades sounds so interesting but an awesome idea isn’t all a book needs… so I hope I enjoy it. Thanks for the review! I love to read but I dont always have time but I do have LOTS of books waiting to be read. I enjoy reading reviews as I can get a feel for what the book is all about. I normally find few paranormal – vampire -witchie books that I want to read and this is one i think that I would like . Thanks for the great review on it. Another one to add to my huge wish list to get to. I seem to like the reviews on this site. The do peak my interest. Good review. I enjoy reading reviews that are obviously unbiased, such as this one. I know how hard it is, as a reviewer, to write criticisms even when deserved because of not wanting to hurt people’s feelings. However I find that the more I feel the author is trustworthy, the more likely I am to read a book they have reviewed. GREAT review! I have had trouble with several “second” or follow-up books lately- like you said, they drag much of the drama out that should be solved or they use ‘gimmicks’ to further the plot. If the characters have been alive as long as you say they have (haven’t seen family in 30 years, then they have), then they should have learned how to deal with a few things by now. Now reason to act like you are still in high school and can’t deal with being attracted to someone and can’t control oneself. That maybe why I have such a hard time reading YA now, they spend more than have the book in angst, not action.